After Perfect Balance and Perfect Balance – new Trials, here is Perfect Balance 2, the latest installment in the Perfect Balance series created by Ville Helin aka ttursas. 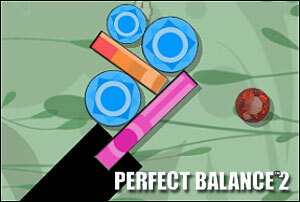 With enhanced graphics, 100 new levels split into 5 level sets and a few nice additions like the diamonds bonus, Perfect Balance 2 is a must play for all Physics-based Puzzle games fans! how do u do level 4??????????? Posted on Tuesday, December 8th, 2009. Follow any responses through the RSS 2.0 feed.